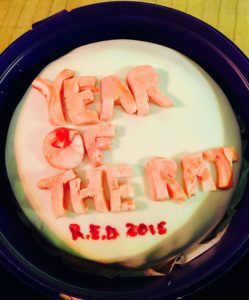 I was lucky enough to be shortlisted for the Read Enjoy Debate (or RED) book awards in Falkirk this year for my first book, The Year of The Rat. It’s always an honour to be on a shortlist and having lived in Scotland for a year I love having a reason to visit – but I wasn’t prepared for quite how spectacular the RED Book Awards are! 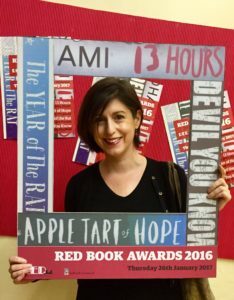 I met the other shortlisted authors – Sarah Moore Fitzgerald for The Apple Tart of Hope, Narinder Dhami for Thirteen Hours, and Cathy MacPhail for The Devil You Know – along with the mastermind of the whole event, librarian Yvonne Manning, the night before. It was already clear from what Yvonne told us that it was going to be a very special day. Each of the seven schools involved did a creative presentation inspired by one of the shortlisted books, and the reading group from the local young offenders institute had written a script which was performed by students from the other schools. The thought and work that had gone into these responses was incredible. Each took a different approach and all were very original. I think I was the luckiest author as the students Bo’Ness Academy had made a chocolate cake for me as part of their presentation! I know all of us felt moved and privileged to see the students’ responses to our books. 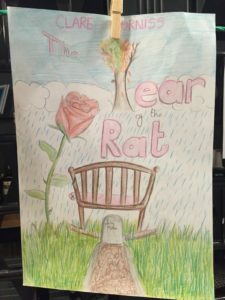 There was a competition for the best book review written by a student and we authors had the hard task of selecting winners from the many brilliant entries in an ‘alternative book cover’ competition. You can see the design I chose below – isn’t it beautiful? 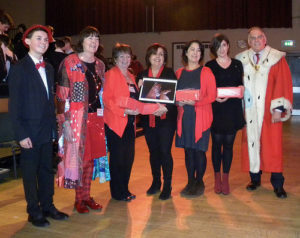 Narinder was crowned RED book award winner at the end of the ceremony but we all felt like winners just to be part of this amazing day, which all happened due to the enthusiasm and creativity of librarians and teachers. There could be no greater example of why librarians and libraries are essential in encouraging reading for pleasure, which all the evidence shows improves academic performance as well as developing empathy, knowledge and a greater understanding of the world. They are key to social mobility. That transformative gift, a love of reading, comes from finding the right book at the right time, and for children who don’t have books at home that is only going to happen if they have access to a library. The Provost of Falkirk, a keen supporter of the RED awards, told us that he had to leave early to go to a budget meeting where cuts to libraries were being discussed. This is happening all over the country, including in Bath where I live, where the council is proposing the closure of libraries and the replacement of trained, experienced librarians by volunteers. Many school libraries are under threat as Children’s laureate Chris Riddell has highlighted. Looking around the theatre in Falkirk full of teenagers who were enthused and excited to be involved in this day devoted to the sheer joy of reading it was all too clear to me what we will be losing if these cuts happen.